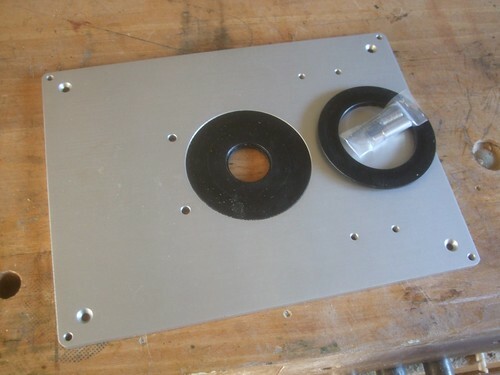 Included with the plate, you get these two reducing rings and, in the little plastic bag, are four tiny grubs screws, an allen key (hex wrench) and four 8mm diameter rare earth magnets. I’ve found both rings to be an incredibly tight fit within the opening. So much, that I had to use a screwdriver to lever one out and then the force of a steel hammer to drive the other one in! A little light work with a metalworking file around the edges soon had it sorted though. On a positive note, at least you don’t have to worry about fiddling with (or losing) any number of tiny screws. 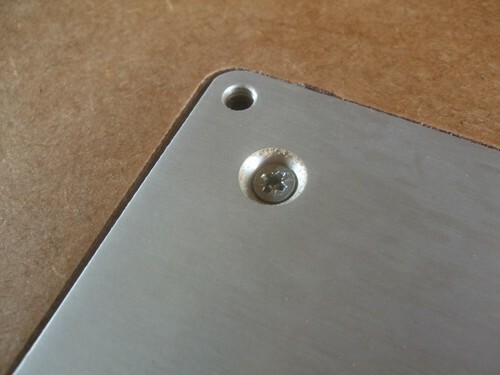 In each of the four corners of the plate, you’ll find two holes – the smaller one is for a grub screw (used to level the plate), while the other allows you to secure the plate down in to your rebate with an 8g countersunk wood screw. I’ve used a 6g screw for the intents of this image, as I couldn’t find anything with a larger shank that wouldn’t break through the underside of the top. It’s unlikely I’ll need to remove and refit the plate often but, an alternative (perhaps even ‘better’) solution would be to use a countersunk machine screw instead, with some kind of nut and washer underneath. Those rare earth magnets are intended to sit in each corner, directly below the threaded holes for the grub screws. 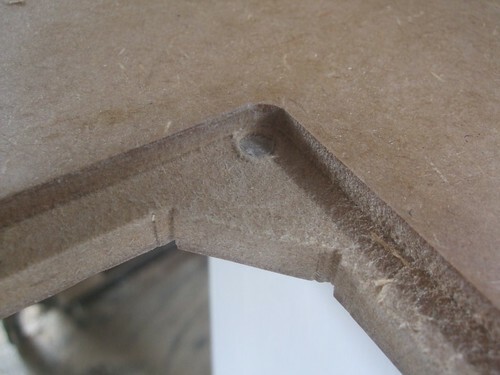 They’ll take all the ‘wear’ from the action of turning each screw and will protect the composite surface below. Also, there is a slight magnetic attraction with the steel in the screws. The weight of a router alone should be enough to hold the plate steady. 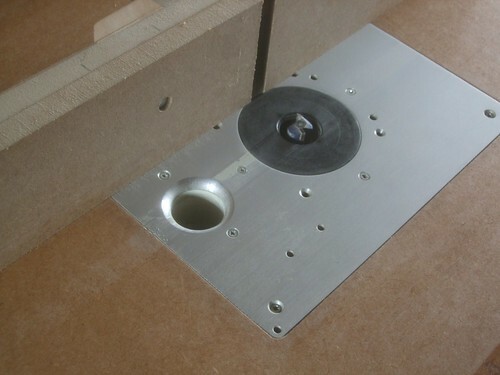 When it comes to drilling holes in a plate to mount your router, some people will agonise over it; others may attempt to buy a jig and, in some cases, you can buy a centring cone to ensure that your router’s base will be perfectly concentric with the opening in the centre of the plate. 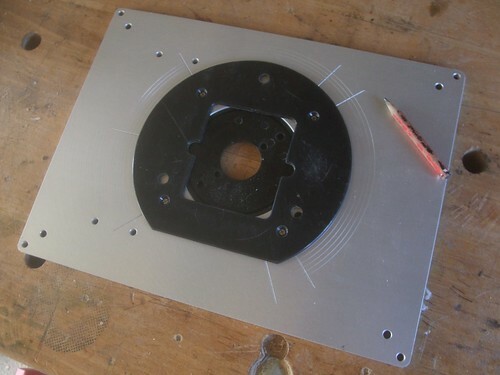 I like what they’ve done here though; scribing the underside of the plate with a series of concentric circles that allow you to align the base plate and then to mark out the hole positions. Those diagonal lines also help to simply this process. Drilling aluminium is nothing to fear even if you only have a very basic woodworking kit. A pillar drill helps to take the strain out of hand-drilling and ensures your holes will be vertical though. I always use a centre-punch to mark each position, before drilling through with a HSS bit and WD-40 as a lubricant. 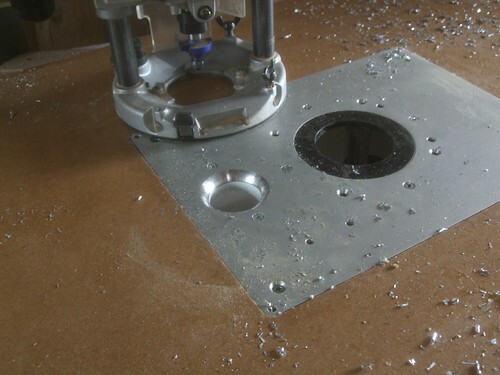 I used a 4.5mm bit here; drilling through from the underside and countersinking after the plate was turned over. I do recommend clamping the plate to a stable surface; regardless of what method you’re using to drill these holes. A back fence can prevent any metal from spinning but, with larger drill bits in particular, there’s always a tendency to ‘lift’ the material as you withdraw the bit… Even at 1,000RPM, a large, aluminium is certainly going to break skin – if not a lot more!! 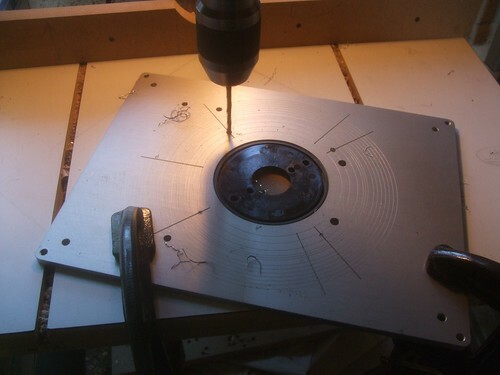 I ended up drilling a second series of four holes towards the end of my router table build, when I realised that I wouldn’t be able to implement an innovative approach to dust extraction from Steve Maskery. 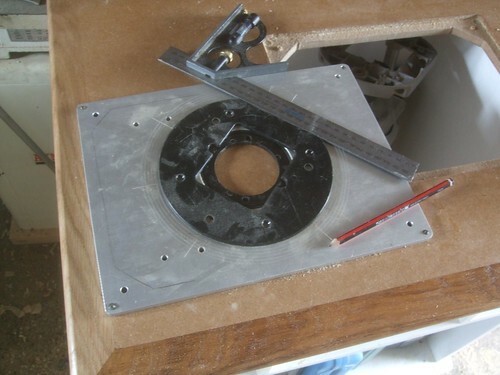 It all starts with the fitting of an 18mm MDF block to the underside of your plate. Steve’s idea allows you to collect the majority of dust generated whilst cutting grooves (which is otherwise very difficult to contain). In my case, this hole is a rather precise 43mm, to accept “40mm” waste pipe. Although my forstner bits go up to 50mm in diameter, I didn’t feel they’d be up to the task of drilling any metal. 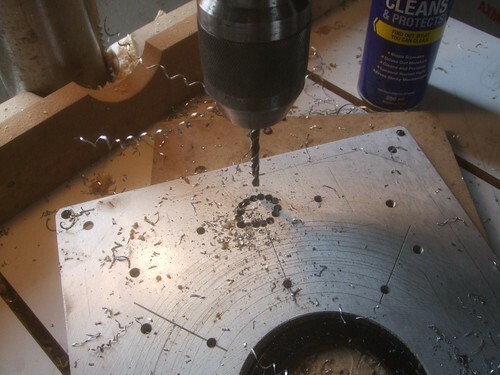 My largest HSS bit is only 10mm so, with the 4.5mm drill still in the chuck, I chose to remove most of the waste here with a series of holes, before punching the waste from the centre with a large flat-head screwdriver and hammer. Then, you fit the blade in place (I also drilled the plate for two more countersunk holes) and, using a bearing-guided round-over cutter (3/8in radius, in my case), trim the excess away. It requires care, patience, small bites and a router set on its slowest speed. Eye protection should go without saying, really! Before routing, I fitted a short length of 40mm pipe in to the hole so, I have actually trimmed it flush with the the internal circumference of the waste pipe, which is ideal for the greatest efficiency of airflow, I think. I took this final photo after a brief grooving operation (in MDF) but without my extractor fitted, so that you can see the path in which the dust does travel. You can also see the intentions behind Steve’s design; drawing as much dust as it can downwards in to the port or chute and, as the rebated material passes over the hole, a ‘channel’ is created. To summarise; I would highly recommend this plate to anyone looking to build their own table. I’m not really sure of why it’s slightly cheaper than their gold aluminium plate (is it really the colour???) 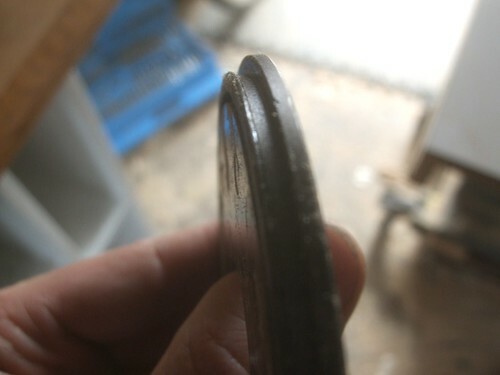 but, unlike some of the phenolic plastic plates on the market, these are dead flat and do not sag under load. If I was being picky, I’d suggest they could’ve supplied a few extra rings. 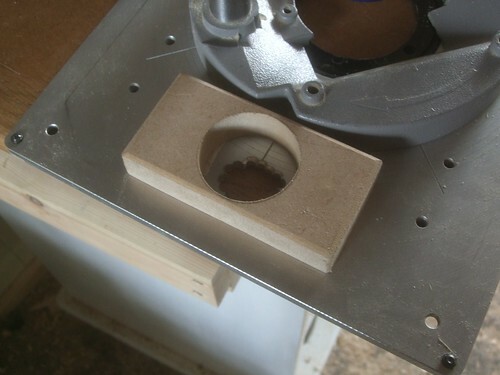 But, it should be a simple task to machine your own, even if you do have to rebate the edges. Two closest to the centre (to the right of the opening) accept a lead-on pin, which is essential for safe freehand routing against a bearing-guided cutter and without the aid of a fence.Those other four holes to the left (in two pairs) are to suit Axminster’s box joint jig, which doesn’t really apply to me. Informative. Thanks Olly. Thinking about making my own with a plane plate of aluminium, so yeah, an interesting read.